Vomitsquad, get ready to welcome Frederick Durand – or, as he’s better known, Snails! – to the Stage AE on Wednesday 21st November 2018!! It’s going to be a mind-squelchingly weird night of heavy bass and screaming synths – grab your tickets NOW for the unique Snails experience while they last!! Collaborating early on in his career with Flux Pavilion and Jack Ü, and receiving plays from other prominent electronic musicians including Skrillex, Snails was quickly recognised by a large audience for his quirky style, smashing together various elements of electronica to create an entirely new genre he and his following have dubbed “vomitstep”. His unique style arises partially from his recording software, Reason, rarely used by other producers. 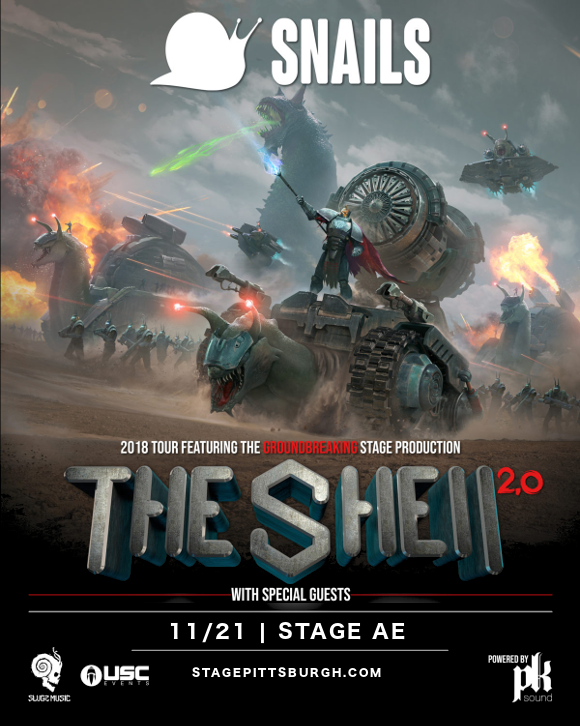 After a stream of massively successful singles and sold-out world tours, Snails is gearing up for the release of his debut studio album, The Shell, with a huge tour to accompany it, containing a custom set and 150,000 watts of PK sound. Snails’ shows are already wild, and this is going to be the most intense party yet. Tickets are expected to sell out very quickly, so don’t miss out – hit that “Buy Tickets” button and guarantee your place at the show! !